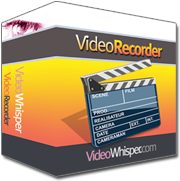 The VideoWhisper Video Recorder software editions are available as free editions. Compared to the purchased licenses these have some limitations but are great for trial evaluation, developers, resellers or low budget websites. No matter what type of php site you are running, this is a fast and easy way to integrate free web based video recording to your site. If you also need rtmp hosting for running the free versions see rtmp hosting options on RTMP hosting plans.